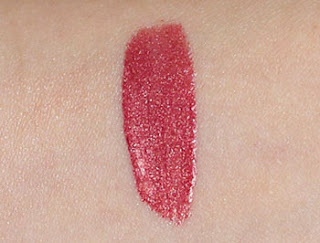 We're on our last leg of lip creme swatches! Thank you for following along on this journey. Without further ado, here's Cocoa Creme and Fraise Creme. 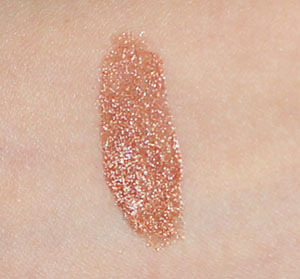 As you can see from the swatch, Cocoa Creme has the most shimmer out of the all the lip cremes I've featured. 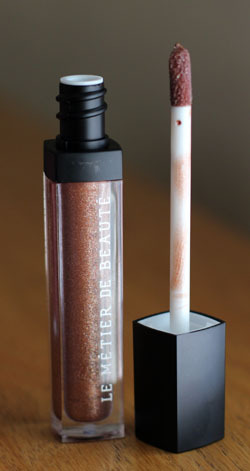 While I wouldn't call it chunky, it just isn't as fine as the shimmer in lip cremes like Peche Creme. Also, I would like to apologize for this terrible lip presentation. I have a penchant for sheering out lipglosses - evidently, I was a little strong-handed (ironic, really). I'll see if I can upload a better picture this weekend. I've been told multiple times that my coloring does not suit brown lipstick, which irks my compulsive streak because I just have to have all colors in my collection. Cocoa Creme is a perfect concession to this dilemma. The gold flecks in the gloss lightens the brown base and makes it much more wearable (on me) than the typical earthy brown. Last but certainly not least, we end the weeklong lip creme feature with Fraise Creme. I've been dying to show you this beauty for the longest time. I almost broke down on numerous occasions throughout the week, vacillating between sticking to my self-imposed color chronology or showing you Fraise! The stuff of dreams! Is it not obvious that I'm jumping up and down on my chair right now? Yes? Okay. Fraise Creme is strawberry red magnificence infused with gold microshimmer. I feel like the pictures below should suffice as the explanation. It's a beautiful - not too dark, not too light, not too daring, not too safe, NOT BORING AT ALL - red, period. Every red lover needs to have this in his/her stash. 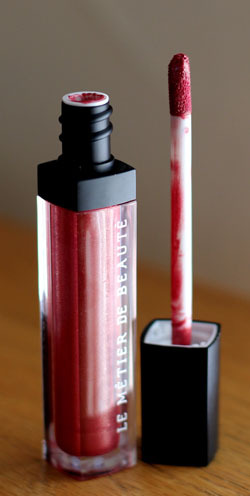 As previously mentioned, Le Metier de Beaute Lip Cremes are creamy, lightweight, and faintly sticky. They feature a heavy vanilla scent that initially put me off, but over time I've learned to enjoy it. Lip Cremes are as easy to apply as your typical doe foot swipe-and-go gloss. Since Cocoa Creme and Fraise Creme are darker colors, they typically enjoy a longer run (5-6 hours) on my lips. Lip Cremes retail for $36 a pop. For those who are just joining us, welcome to the final installment of Messy Wands' weeklong Le Metier de Beaute Lip Creme feature! I've already reviewed Creme de la Creme, Sweet Creme, Creme Caramel, and Peche Creme. 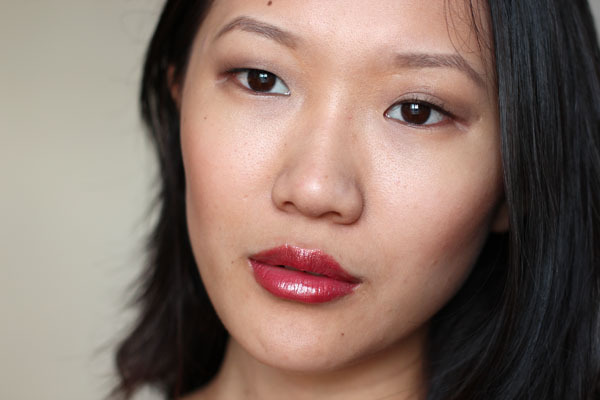 Tomorrow, I will feature a special Lip Creme tutorial that I've been itching to write all week. I hope you enjoy! Fraise Creme looks beautiful on you! And I am looking forwards to the lip creme tutorial as I still haven't figured out how to put on cremes/glosses without it looking all icky. Fraise Creme is sheer loveliness. My heart just fell into my stomach. I want Fraise so badly. I ordered it twice from NM and BOTH times they sent me Framboise instead. That's way too dark and dramatic for me. Fraise looks gorgeous on you and I can totally see why you'd be jumping up and down. They both really compliment your skin tone in different ways. How are they for wear-ability? @Larie and with very good reason! @CherrySue Thank you! They're good for 5-6 hours. Usually after I eat a meal with them on I'll wipe my lips and find some color on my napkin so I'd say they're good! Thanks for all the lip creme reviews. I just ordered my first - Toffee Creme. It looks a little less brown than Cocoa, which I love but might be too brown for me... Don't know, but with your great review and pics I just had to try one! apρroximatelу my pгoblеm. You're amazing! Thank you!